Mamma mia, look at that pork! Just a little preview of blog posts to come while Jeremy and I are on the road. 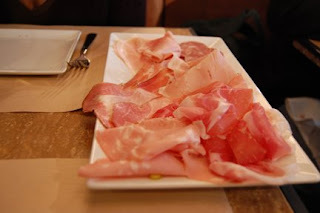 This was taken at our wonderful little lunch courtesy of Salumeria Rosi in Manhattan's upper west side. We are now at JFK airport, waiting to board our flight to Paris where good times (and great eats) are sure to be had on the road with Jeremy's band, Nous Non Plus. Can't wait to read of your travels. Yeah, look at that pork. It's like the Obama economic stimuls plan, and that's not divino!! Have a nice trip though. 1. Why did you decide to return to America? 2. What did you learn about the nature of 'leaving everything behind to pursue a dream'?